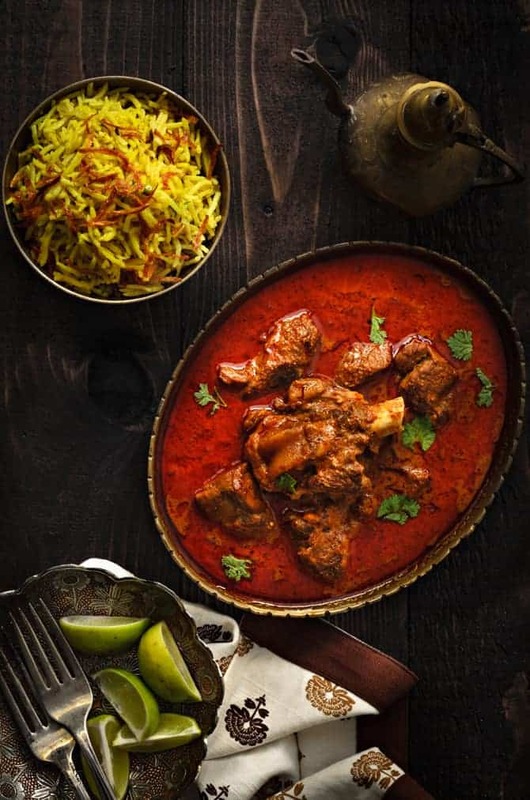 Authentic Mutton Korma or Lamb Korma is a traditional fragrant qorma, an Awadhi dish, indeed to die for. One of the finest royal mutton recipes loaded with rich Mughlai flavours to feast on together with your family. 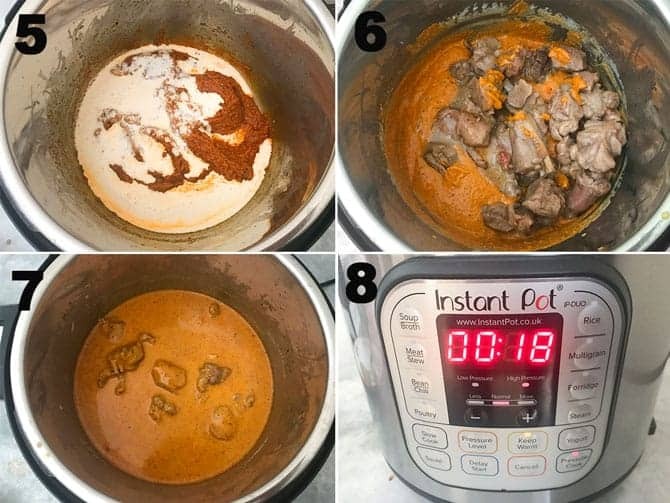 Here is how to make mutton korma recipe step by step in Instant pot and pressure cooker. Kebabs, kormas, biryanis are a section of lavish Awadhi cuisine since Mughal era. Lucknowi cuisine, especially, curries and qormas are basically a meat or chicken braised with spices, some nuts, browned onions and yogurt. They are mostly a mild preparation making a use of Kashmiri red chilies to get rich red colour but gentle on palate. 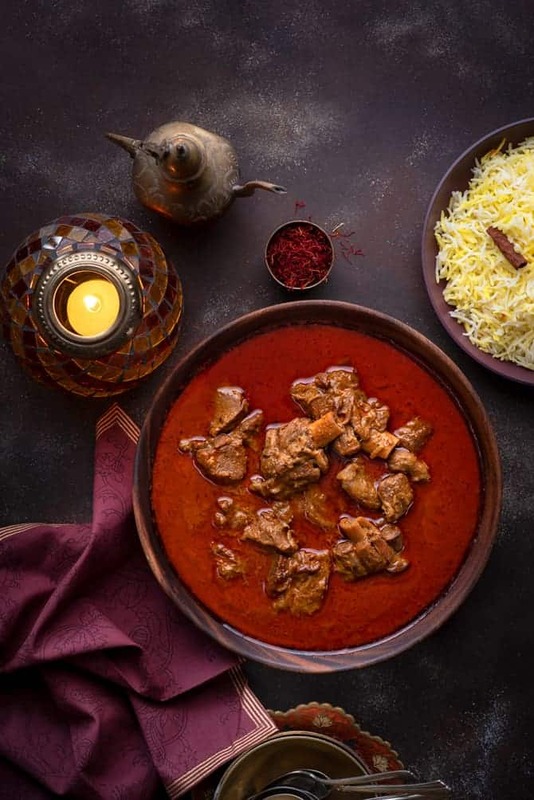 Traditional mutton korma is a rich Lucknowi stew of lamb or goat meat slow cooked in brown onions, nuts, spices, yogurt and aromatic essences like saffron and kewda (screw pine). Yogurt gives beautiful velvety base, ground brown onions gives texture and gentle spices with nuts gives richness to this exceptional korma. The prime ingredient that gives this royal mutton curry, a rich aromatic soul is kewra, also known as screw pine. And of course Saffron. Kewra is an immensely important element when we talk about the preparation of Awadhi/Mughlai recipes like Biryanis, Kormas and kababs. Traditionally, this shahi mutton korma recipe is prepared in copper handis over a charcoal fire. For a crunch of time, you can go ahead with pressure cooking. But if time permits, I would highly recommend you to cook it in handi or pot on stove top, braising meat in spices for hours until done. The aura of this gosht korma is rich, smooth, delicate and exceptional. In our Muslim community, it is one of the top menu in weddings or celebrations in Northern India, especially in Lucknow. Very commonly referred to as shadi wala korma (korma made in weddings) in many homes. Primarily, the best meat cut for the preparation of mutton korma is lamb or goat shoulder cut. Especially, when you are planning to make it traditionally in handi (pot) over stove top, I would highly recommend you to use this particular cut. Shoulder cut meat is soft in texture, delicious and cooks much faster than the raan or hind leg cut. Raan or hind leg cut is best for barbecues and kababs. However, you can choose to use hind leg cut for pressure cooker method. 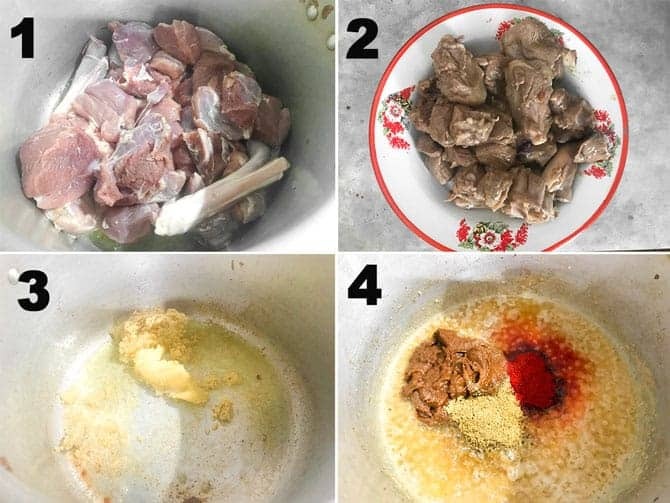 Personally, I always prefer using goat shoulder meat due to a reason that it gives a perfect taste, quality and appearance to the whole dish. 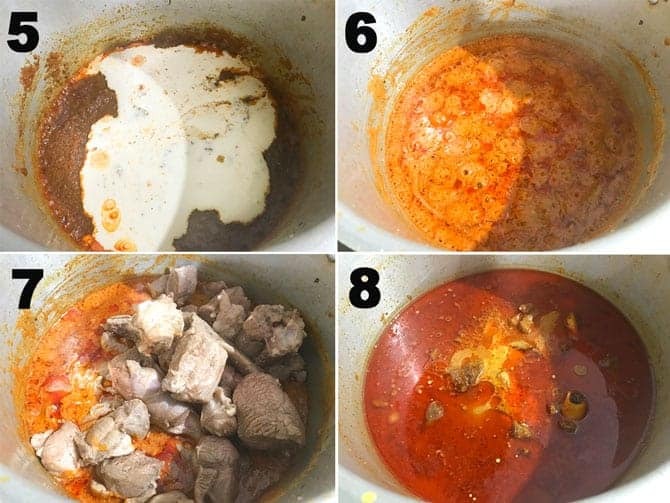 What goes in Mutton Korma Recipe? Meat – Goat or lamb on bone cut into medium sized pieces. You can also use beef cut to make this korma recipe. Avoid using too much of ribs or chops. Brown Onions or caramelised onions – As I always store brown onions or birista in bulk, the job gets easier for me. But, I am demonstrating below how to fry onions to make korma. 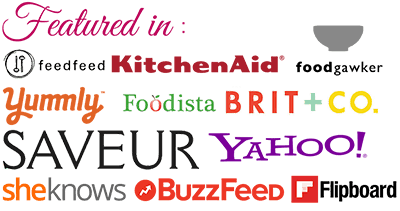 Or you can also refer to this link to make birista in bulk and freeze. Yogurt – A well whisked full fat yogurt gives amazing velvety texture and taste to the dish. In order to avoid splitting of yogurt while cooking, you may add 1 teaspoon of cornflour. Nuts and Seeds – Cashew nuts and Poppy seeds. In most of Middle East region, poppy seeds are banned, hence the unavailability. In this case you can use melon seeds to make mutton korma. If you are allergic to cashews, then go on ahead with using almonds. Blanch and peel it, and then blend it with onions to make a paste. As I have mentioned above, select the best fresh meat cut to make korma recipe. Brown onions are the base to any korma recipes. Be sure to fry them on medium heat to golden only to avoid it getting burnt. 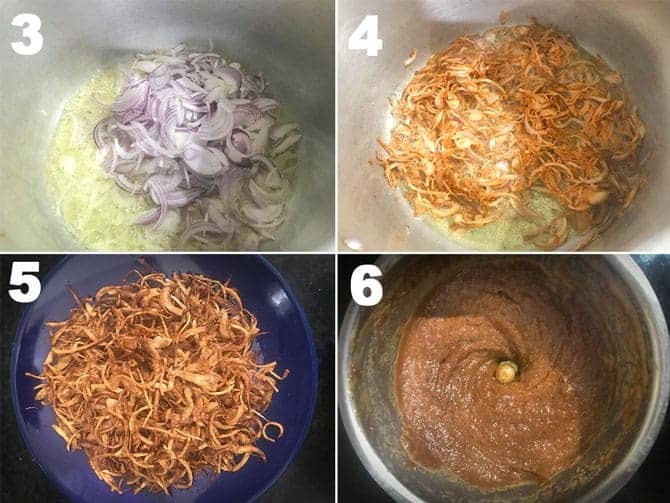 The burnt onions will lend bitter and bad flavours to the dish. Traditionally, korma is cooked in ghee only. But you can use oil or a mix of ghee and oil, both. Always sear the meat in ghee or oil, as it will lock the meat juices within and will give rich flavour to the curry. Avoid adding too much of water at a time, as the consistency of the dish it not watery or thin but a nice medium thick gravy. So 1 kg of meat should have 450 ml or max 2 cups of water for perfect consistency especially when cooking in pressure cooker. Always whisk the yogurt or curd very well before adding it to the masalas. This will avoid it getting split. However, even after whisking it well, if you are worried about its splitting, then add 1 teaspoon of cornflour and whisk it well. This way yogurt won’t curdle at all. Authentic Awadhi Korma do not call for the addition of turmeric powder and green chilies. Hence avoid it if you want to relish the real Mughlai version of the korma dish. The mutton korma recipe can easily be made in pressure cooker, Slow Cooker as well as in Instant pot. 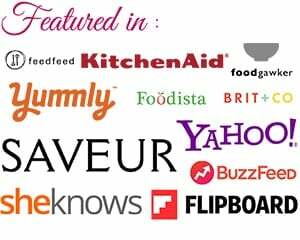 Below you will find the step by step instructions for instant pot and pressure cooker method. This preparation of Awadhi mutton curry is simple yet glamorous and aromatic. And yes, not only with naans or sheermals, but you can call for parathas or even phulkas and pulaos or jeera rice to brace up the mutton korma beautifully. When you have guest at your home, surprise them with this delectable rich preparation from Lucknow and enrich your spread to royal one. Not only this mutton korma is our family favourite but the most popular Awadhi Mutton yakhni pulao is also our all time love. If you wish to make in a traditional manner, which I would highly recommend you, then follow the same steps to make it in handi or pot. Just that, cooking time will vary, which will be more in traditional handi mutton korma recipe than the pressure cooker method. To begin with, for awadhi mutton korma recipe, soak a pinch of saffron in 2-3 tablespoons of milk and keep it aside. 2. Now, dry roast the 10-12 cashew nuts, 1 tsp poppy seeds, 5-6 green cardamom, 1.5 inch of cinnamon sticks, 2 black cardamoms, 6-8 cloves and 6-8 peppercorns. 4. Fry them until golden brown and crisp. Do not over brown them as it might give the bitter to korma. 6. Once the brown onions are done, then in a blender, add all the dry roasted ingredients along with brown onions. Now, blend it to make a smooth paste. Set it aside. 1. Heat the 5 tbsp ghee mixture, add 1 kg of mutton pieces and fry until they sear to nice golden brown. 2. Once done, take the mutton pieces out and reserve. 3. Now, add remaining 2 tbsp ghee, add 1 tbsp ginger paste and 1 tbsp garlic paste in the same handi and fry well for 2-3 minutes. 4. Then ground masala onion paste, 1 tbsp coriander powder and 3/4 tbsp Kashmiri red chili powder, mix well. 5. Add 250 gms of whisked yogurt and stir until well blended. 6. Cook for 3-4 minutes or until oil starts releasing out. 7. Then add fried mutton pieces, salt and 450 ml water. Cover and pressure cook until mutton is just tender. Fragrant delicious Lucknowi Gosht Korma is ready to serve. Finally, garnish Awadhi mutton korma with some coriander leaves (optional) and serve hot with Nan/sheermal/paratha or Pulao of your choice. 2. Take the seared meat out on to a plate and set aside. 3. Add remaining 2 tbsp ghee in the pot. Then add 1 tbsp ginger and 1 tbsp garlic paste. Fry for 30 seconds on normal sauté mode. Stir to avoid it getting stuck at the bottom. 6. Add seared meat, salt and 450 ml of water and mix. 7. Close the lid of the pot with vent in sealing position, switch off the sauté mode and press manual/pressure cook mode. Set the timer to 18 minutes and allow it to cook. 8. Once the IP beeps, allow the pressure to release naturally for 6-7 minutes and then quick release. Switch on the sauté mode on low, add saffron milk, nutmeg-mace powder and kewda, mix and cook for another 1 minute only. Instant Pot Awadhi Mutton Korma is ready to serve. Have you tried this “Mutton Korma Recipe“? Please feed us with your ★ star ratings and comments below. 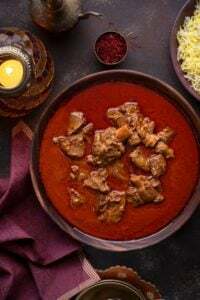 Awadhi Mutton Korma (Lamb Korma) is a fragrant royal (shahi) preparation of slow cooked lamb/goat meat stew with nuts, spices, brown onions and yogurt. 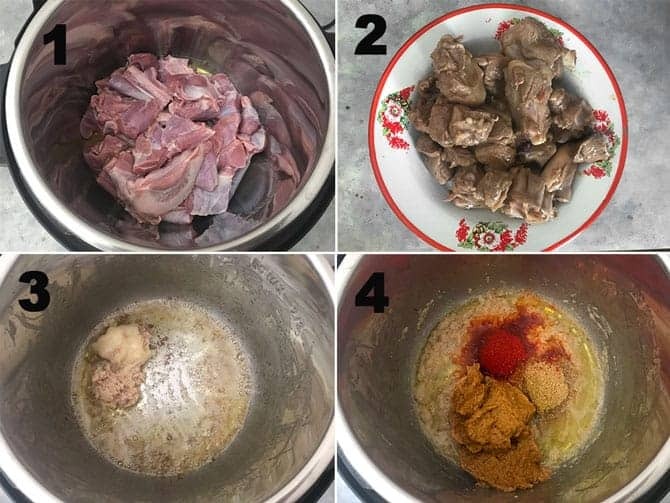 One of the best mutton recipes with stove top and Instant pot pressure cooker instructions step by step. 1 kg Lamb or Goat Meat (mutton on bone) cut in pieces. Soak a pinch of saffron in 2-3 tablespoons of milk and keep it aside. Heat 5 tbsps of oil in pan. Then, add 3 large finely sliced onion. Fry them until golden brown and crisp. Do not over brown them as it might give the bitter to korma. Once the brown onions are done, then in a blender, add all the dry roasted ingredients along with brown onions. Add mutton pieces and fry until they sear to nice golden brown. Take the mutton pieces out and reserve. Add remaining ghee in the same pressure cooker. Now, add ginger paste and garlic paste and fry well for 2-3 minutes. Then ground masala-onion paste, coriander powder and red chili powder, mix well. Add whisked yogurt and stir until well blended. Cook for 3-4 minutes or until oil starts oozing out. Then add fried mutton pieces, salt and 450 ml of water. Cover and pressure cook until mutton is just tender. Then, add saffron milk, kewda essence, mace and nutmeg powder and mix. Fragrant mutton korma is ready to serve. Place the inner pot and switch on the IP. Press 'Sauté' mode and wait until it displays 'Hot'. Take the seared meat out on to a plate and set aside. Add remaining ghee in the pot. Add ginger and garlic paste. Fry for 30 seconds on normal sauté mode. Stir to avoid it getting stuck at the bottom. Add brown onions masala paste, red chilli powder and coriander powder. Stir and cook for minute. Add seared meat, salt and 450 ml of water and mix. Close the lid of the pot with vent in sealing position. Switch of the sauté mode and press manual/pressure Cook mode. Set the timer to 18 minutes and allow it to cook. Once the IP beeps, allow the pressure to release naturally for 6-7 minutes and then quick release. Switch on the sauté mode on low, add saffron milk, nutmeg-mace powder and kewda, mix and cook for another 1 minute only. Instant Pot Awadhi Mutton Korma is ready to serve. Traditionally, mutton korma recipe is made in copper handi, but we can make it in a instant pot and pressure cooker to save time. Mutton Korma can made in slow cooker also. You can make mutton korma in oil instead of ghee or use a mix of oil and thee both. I haven’t seen this delicious Lucknowi recipe yet!